$139.00 This may be in stock for quick delivery; please call! The PRO-1 is a terrific first step into the world of guitar featuring all of the PRO Collection's breakthrough features. Epiphone, one of the world’s oldest and most respected guitar makers, has just made playing and learning guitar easy for everyone. Creating a truly easy-to-play guitar wasn’t easy. And at Epiphone, we take making a great guitar seriously, no matter what the player’s level. So Epiphone rethought the guitar from top to bottom to make an instrument that anyone can play right away. The result is a truly “PRO” guitar that’s easy to play, easy to own, and most importantly, delivers the full, vibrant sound that Epiphone is known for. 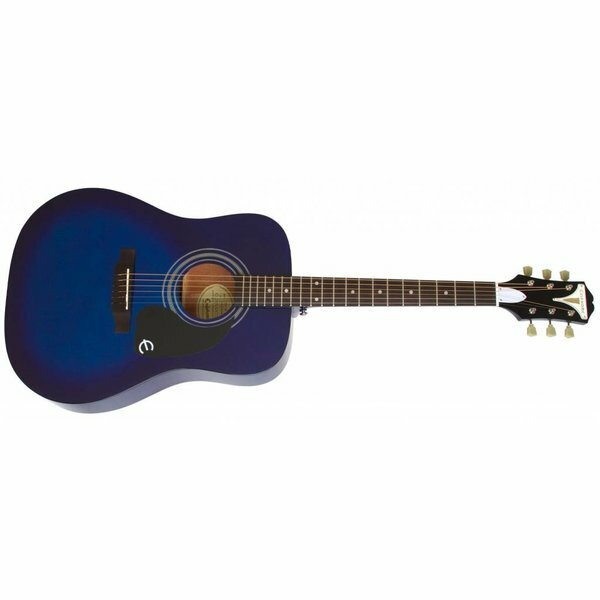 The PRO-1 acoustic guitar is the result of exhaustive analysis, numerous technological innovations, and suggestions from a “who’s who” of professional players. And now it’s time to play! Less fatigue. Wrap your hand around the PRO-1 Ultra neck and you’ll immediately feel how comfortable it is. Our new EZ-Profile™ neck is designed so your hand can easily form chords without feeling fatigued. Effortless Fretting. Epiphone JumboPRO™ frets make fretting notes and chords seem effortless. JumboPRO™ frets are taller and wider than smaller frets. So, when you push down a string, it’s easier to make string contact with the fret with less hand fatigue and finger friction. Shorter is Easier. Scale length is the distance from the saddle to the nut. The shorter the scale length, the “looser” the strings feel. Because the PRO-1’s scale length is almost 1” shorter than most acoustic guitars, the strings are under less tension so you don’t have to press hard to get good tone. And – since the frets are closer together-- making chords is easier! Make friction fiction. String and fingerboard friction not only slows your playing but also can hurt. Our PRO-Ease™ string and fingerboard coating provides sleek, smooth action with reduced string noise. No pain, no gain? Nonsense—Epiphone believes in “no pain.” Lighter gauge strings are easier to play so every PRO-1 is set-up and equipped with Epiphone Ultra-Light strings. Easy action. With Epiphone’s Dual-Action truss rod, you can adjust the neck in both directions, which not only stabilizes the neck but also makes set-up easier and more precise.